The national bestseller Odd Girl Out exposed a hidden culture of cruelty that had always been quietly endured by American girls. As Rachel Simmons toured the country, these girls found their voices and spoke to her about their pain. They wanted to talk-and they weren't the only ones. Mothers, teachers, counselors, young professional women, even fathers, came to Rachel with heart-wrenching personal stories that could no longer be kept secret. Here, Rachel creates a safe place for girls to talk, rant, sound off, and find each other. The result is a collection of wonderful accounts of the inner lives of adolescent girls. Candid and disarming, creative and expressive, and always exceptionally self-aware, these poems, songs, confessions, and essays form a journal of American girlhood. They show us how deeply cruelty flows and how strongly these girls want to change. 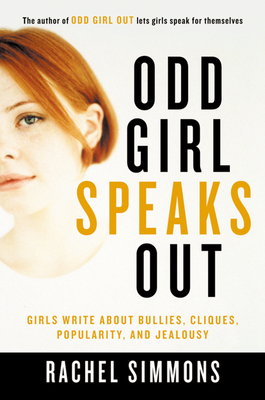 Odd Girl Out helped girls find their voices; Odd Girl Speaks Out helps them tell their stories. do it right in front of you. I'll whisper at my friends and look at you the whole time. Then we'll all cut up laughing. You know we're talking about you. told her we were being mean. But we just couldn't be friends with her anymore. "A heartening book, and tonic for these politically polarized times." "She's motivated by the victim's pain, but also aware of the pain of the perpetrators and believes they can change."